James M. Simms (James Meriles) The First Colored Baptist Church in North America. Constituted at Savannah, Georgia, January 20, A.D. 1788. With Biographical Sketches of the Pastors. Philadelphia: Printed by J. B. Lippincott Company, 1888. African American Baptists -- Georgia -- Savannah -- History. African American churches -- Georgia -- Savannah -- History. 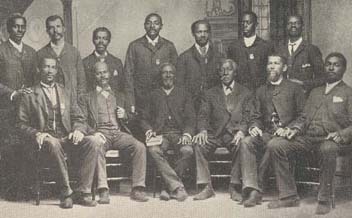 African American clergy -- Biography. African Americans -- Georgia -- Religion. Baptists -- Georgia -- Savannah -- History. First African Baptist Church (Savannah, Ga.) -- History. First Bryan Baptist Church (Savannah, Ga.) -- History. First Colored Baptist Church (Savannah, Ga.) -- History. Savannah (Ga.) -- Church history. University of Alabama in Birmingham provided the text for the electronic publication of this title.